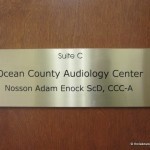 It’s been a year since Ocean County Audiology Center opened its doors in Lakewood. Dr.
who have trouble with their hearing. custom made swim molds/earplugs are only $25. See page ___ for OCAC’s advertisement. unreported, experts agree that figures worldwide are on the rise. decided to pursue audiology as a career. to all their needs only a few minutes from home. 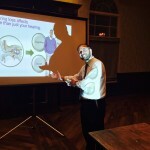 The Shopper spoke with Dr. Nosson Enock about his expertise in audiology. has a problem hearing, and what can be done about it? and those acquired after birth. an audiologist for further testing. circumstances the child himself probably won’t realize what ‘normal’ hearing he’s lacking. appearing not to hear certain sounds. “huh?” or switching on the volume high when listening to music. It is obviously harder to detect hearing loss in a child who is otherwise developmentally delayed. attention should be given to any indication of hearing loss. you say, the child is otherwise doing well? treatment until the age of 12, he will never be able to acquire the ability to speak. emotional difficulties and low self esteem, and learning and social/ behavioral issues in school. the child to make up for lost time. What type of treatment is available for children with hearing loss? and may subsequently recommend surgery (ear tubes) where an excess of fluid occurs. problem will clear as the child matures). Can you explain what cochlear implants are? when a cochlear implant awakens their hearing, the better they will do. heightened sensitivity and understanding of the problems and issues of others! people suffer from some degree of hearing loss as they age? illness, ototoxic (ear damaging) drugs, tumors, head injury and exposure to loud noise. Impairment can range from mild to complete deafness. worsen their condition. Studies have shown that the opposite is true! hearing aids if required; social interaction is known to promote recovery. Call Ocean County Audiology Center at 732-987-6590 to solve your hearing problems today.